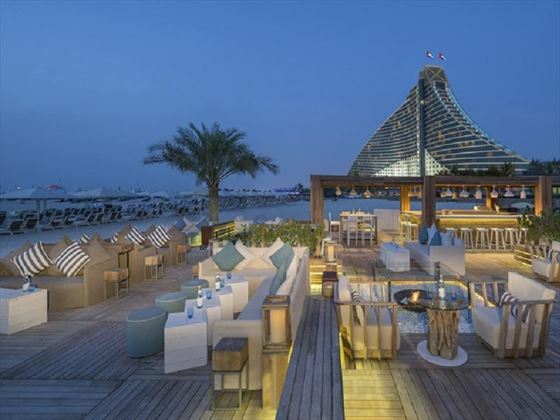 Promising one of Dubai's most desirable beachfront postcodes as well as an outstanding example of contemporary architectural design, Jumeirah Beach Hotel is a 5-star property and not to be missed if you want to experience the UAE in style. This place is dripping in luxurious finery and from the huge range of fitness facilities to pure pampering perfection at the spa, no pebble has been left unpolished when it comes to your complete and utter indulgent fantasies. 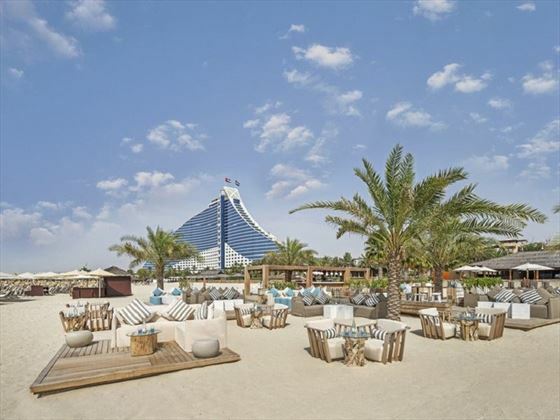 An ideal escape for families, couples and small groups alike, Jumeirah Beach Hotel is guaranteed to exceed all of your expectations with plenty of reasons to write home and make the folks green with envy. 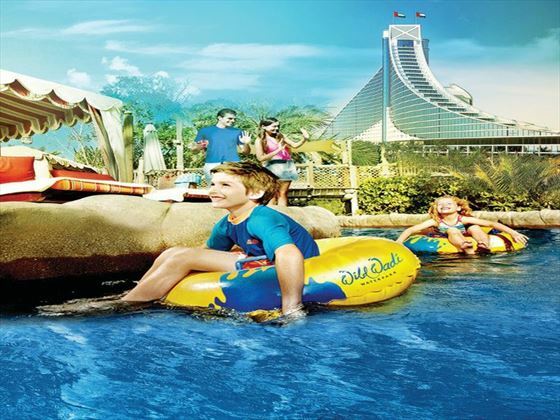 Situated right next door to the Wild Wadi Waterpark with its own private beach and superb views of the Arabian Gulf. This hotel puts you right at the heart of the action with all the cafés, restaurants and attractions of 'The Walk' just moments from your front door. Dubai's international airport is just over 30 minutes' drive away. 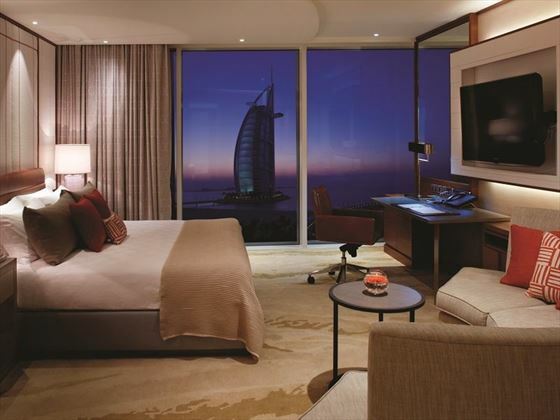 Ocean Superior Room – Contemporary 50sqm rooms with uninterrupted views of Burj Al Arab Jumeirah and the private beach through its floor to ceiling windows. Sleeps a maximum of two adults and two children. Ocean Superior Balcony Room – With the same amenities and suitability as before, plus a balcony with gorgeous views of the hotel marina. Sleeps a maximum of two adults and two children. 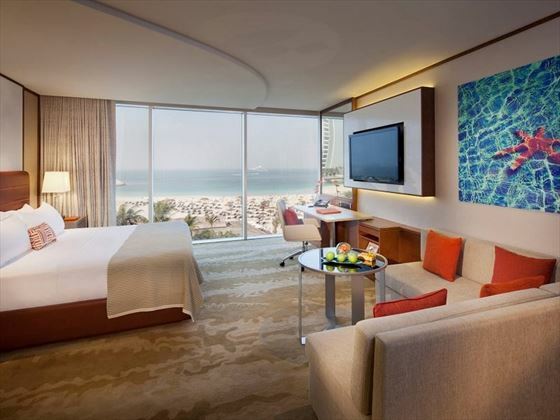 Ocean Deluxe Room – Modern 50sqm rooms with nature-inspired décor, and floor to ceiling windows looking out onto the beach and sparkling Arabian Gulf. Sleeps a maximum of two adults and two children. Ocean Deluxe Balcony Room – With the same amenities and suitability as before, plus a balcony with beautiful views. Sleeps a maximum of two adults and two children. 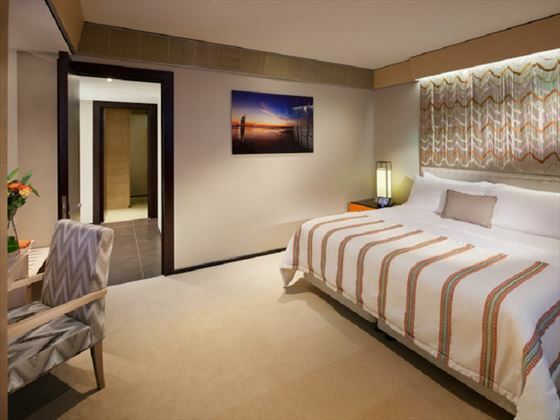 Ocean Superior Club Room – Recently refurbished, these modern 50sqm rooms offer access to the family-oriented Premium Leisure Club and adult-only Club Executive, which includes, breakfast, lunch, pre-dinner canapés, access to the Executive Pool, and free airport transfers. Sleeps a maximum of two adults and two children. Ocean Club Room – Nature-inspired décor, with lovely views of the ocean and access to Premium Leisure Club and The Club Executive and their amenities. Sleeps a maximum of two adults and two children. 50sqm. Junior Ocean Suite – Located at each side of the hotel, featuring its own spacious sun terrace, access to the clubs and their amenities and facilities, and a calming ambience. Sleeps a maximum of two adults and two children. 105sqm. One Bedroom Ocean Suite – Nestled at the sides of the hotel, with uninterrupted views from the sun terrace. Featuring a separate living room, and access to the clubs and its amenities. Sleeps a maximum of two adults and two children. 128sqm. Two Bedroom Ocean Suite – Sitting in the eastern wing of the hotel, these 160sqm suites have amazing views of the city from the sun terrace, plus a separate living room, two bedrooms, and access to the clubs are their amenities. Sleeps a maximum of four adults and two children. 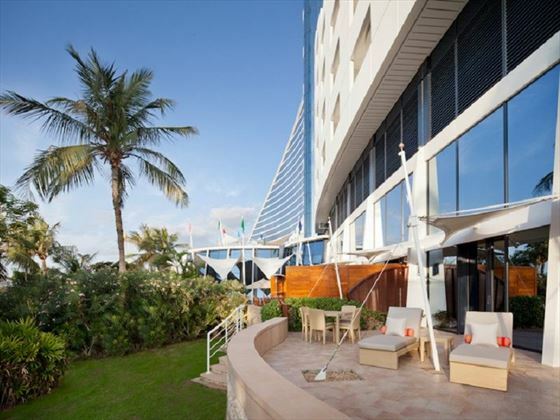 Two Bedroom Exterior Suite – Located on the western wing, with stunning views of Burj Al Arab Jumeirah and Wild Wadi Waterpark from the sun terrace. Featuring a separate living room, two bedrooms, and club access. Sleeps a maximum of four adults and two children. 160sqm. 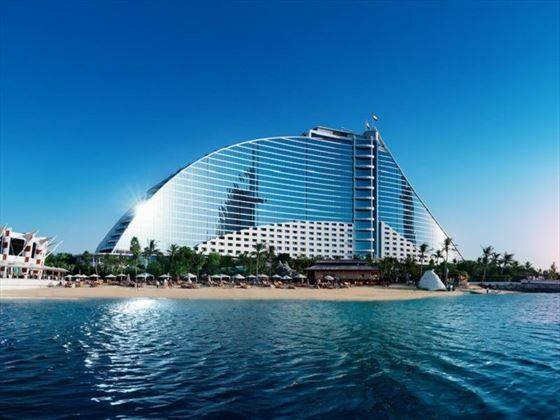 Three Bedroom Ocean Suite – Sitting on the sides of the hotel, these 215sqm suites have striking views of Burj Al Arab Jumeirah and the beach, whilst the sun terrace overlooks the city or Wild Wadi Waterpark. Guests also have access to the clubs and their amenities. Sleeps a maximum of six adults and two children. Family Garden Suite – Nestled on the ground level, these 148sqm modern suites feature a private terrace area with direct access to the leisure pool and gardens. 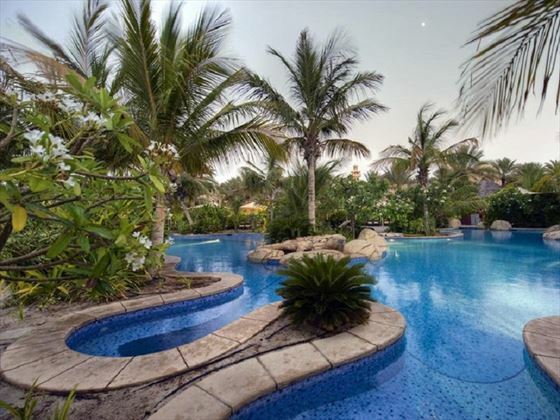 Offering a separate living room, a family room and a main bedroom, plus access to the Premium Leisure Club, the Executive Pool, and free airport transfers. Sleeps a maximum of three adults and two children. Presidential Suite – Located on each side of the hotel, you have two suites to choose from. Choose between 160sqm of space over two floors with nature-inspired décor, or 216sqm of space with an extra-large living room and Royal décor. Both feature a spacious bedroom and a sun terrace. Also features access to the clubs and their amenities. Sleeps a maximum of two adults and two children. 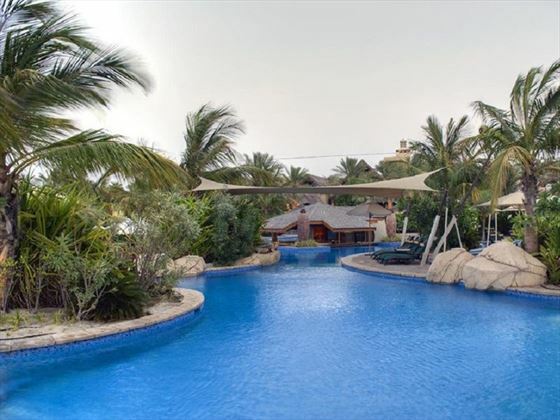 Beit Al Bahar One Bedroom Royal Villa – Gorgeous 130sqm suites featuring a private terrace and plunge pool overlooking the private garden, a separate living room with dining table, and 24 hour butler service. 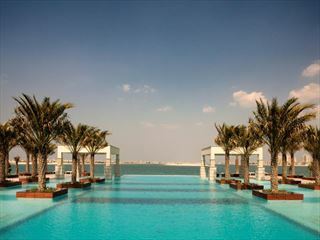 Guests also receive complimentary daily breakfast and afternoon tea, plus access to the clubs and the Executive Pool. Sleeps a maximum of two adults and two children. 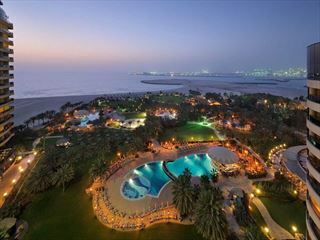 Beit Al Bahar Two Bedroom Royal Villa - With the same amenities as before, this time with two bedrooms. Sleeps a maximum of four adults and two children. 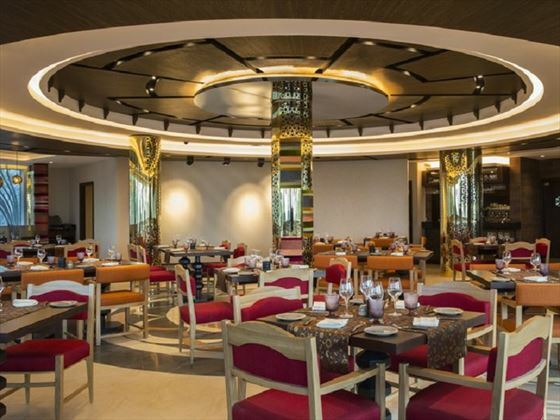 Al Khayal – stylishly decorated and offering the very best in Lebanese cuisine from 7pm – midnight. Der Keller – raw red bricks, solid oak barrels and delicious sizzling sausages – this is as authentic a German dining experience as you're going to get. D&A – a traditional British menu set against a classic Dhow & Anchor backdrop complete with a spacious terrace area and refurbished dining room open for lunch and evening meals. Jamie's Italian - Italian dishes, rustic chic and all the friendly service associated with Jamie Oliver and Gennaro Contaldo. La Parrilla – Latin-American dishes combine with awesome views from the 25th floor for a formal evening dining experience not to be forgotten. 360 – Pan-Asian dishes and cool vibes served at the end of the marina walkway. Waterfront – all-day healthy dining options including: sushi, seafood and Australian grilled lamb. 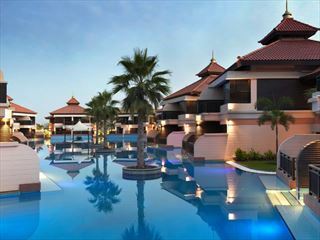 Ocean Blue – fruit juices, cocktails, healthy snacks and main meals served within the lush gardens around the leisure pool. Beachcombers – Pan-Asian dishes and fabulous theme nights open for breakfast, lunch and evening meal. Carnevale – Italy meets the Middle East at this charming evening restaurant. Latitude – a wide range of Asian and European flavours within an all-day dining ambience. Mahiki – tropical grill menu and an exciting Polynesian atmosphere. La Veranda – laid-back pizzas overlooking the ocean. 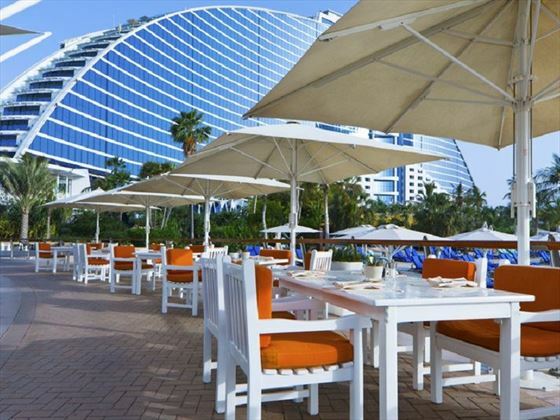 Villa Beach – Mediterranean fare for lunch and dinner just yards from the water's edge. Uptown Bar – plenty of light bites, drinks and cocktails and a stylish rooftop setting. Palm Court – afternoon tea, sandwiches and cakes within the distinctly grand lobby lounge. Latitude Creations – artisan breads, pastries, desserts and delicacies served from 9am – 9pm. Ocean Blue – poolside snack bar with a selection of healthy snacks and drinks. Please note the hotel will be closed from May - October 2018 for a complete renovation.